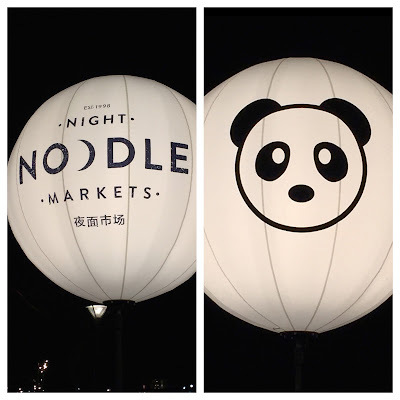 So for the next two weeks (Oct 8th - 25th) the Night Noodle Market is on at the north end of Hyde Park just a stone's throw away from our apartment. It's part of the Good Food Month put on by the Sydney Herald. There were various stages for sitting and eating, as well as DJs and dancing. 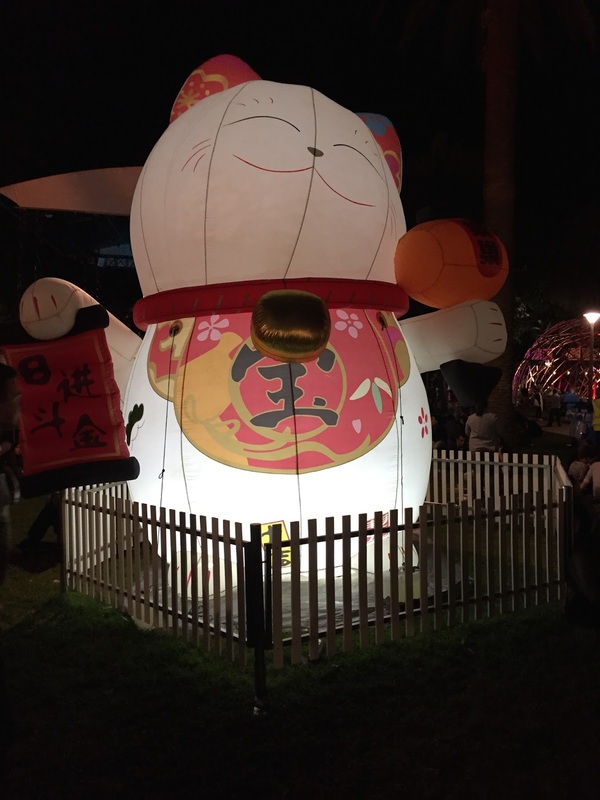 Lots of "Lucky Cats" decorating the place, this is the one that greets you at the south entrance, there's a wall of them at the north entrance all "red carpet style" where you can pose with a mike. 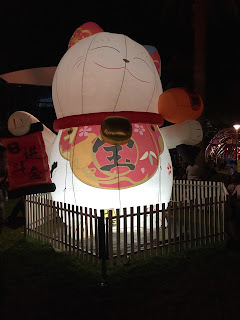 There was even a lion dance. 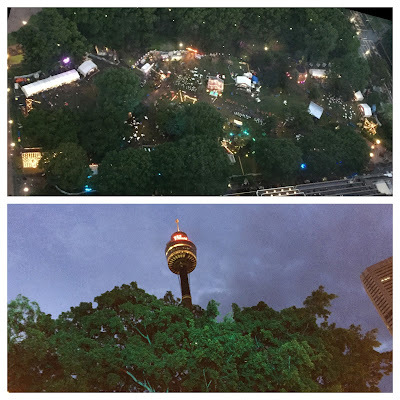 We happened to visit the Sky Tower in the Westfield and caught this great dusk aerial view of the night market, below is the reverse view of the tower. One of the Filipino restaurants featured a roasted pig rice dish and some tasty skewers. 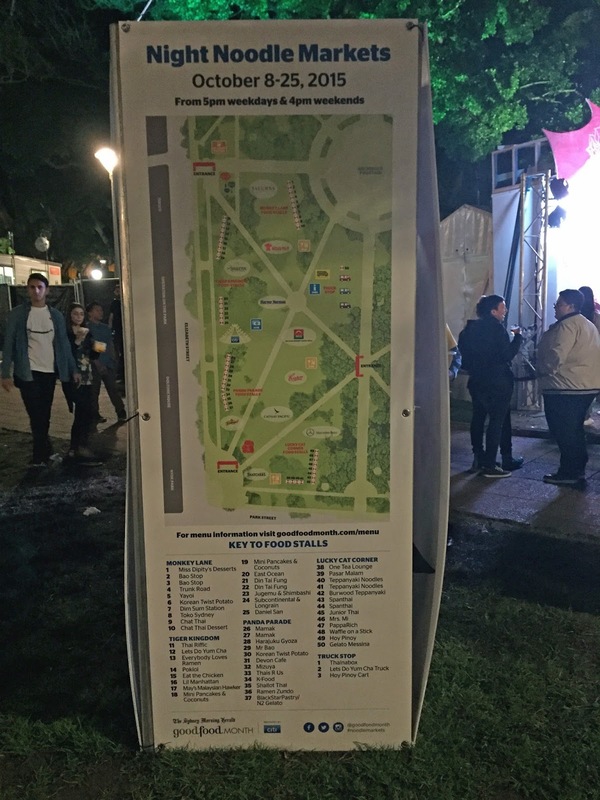 Here's a picture of the map. Sorry it's a bit dark, but just in case anyone is looking to visit. They had a section for food trucks, there were only four in attendance. Another shot of the food stalls. If you're in the area I highly recommend it, it's a fun night out, if you can't stand the crowds you can grab some food and then wander down to the south part of the park and throw down a picnic blanket and enjoy the spring evening.